UPDATE: Due to the inclement weather expected this weekend, Puppy Palooza at “The Local Cafe” in Granbury has been postponed. The new date is May 11, 2019. The Local Cafe in Granbury will be holding their annual “Puppy Palooza” Saturday April 13th, 2019. It’s a day of fun, food, music and of course loveable dogs and puppies. The day starts out with Puppy Yoga from 11am – 12noon. Then Puppy Palooza kicks off at noon until 3pm with music and lots of vendors. T-Bone Stearns will be on stage during that time. 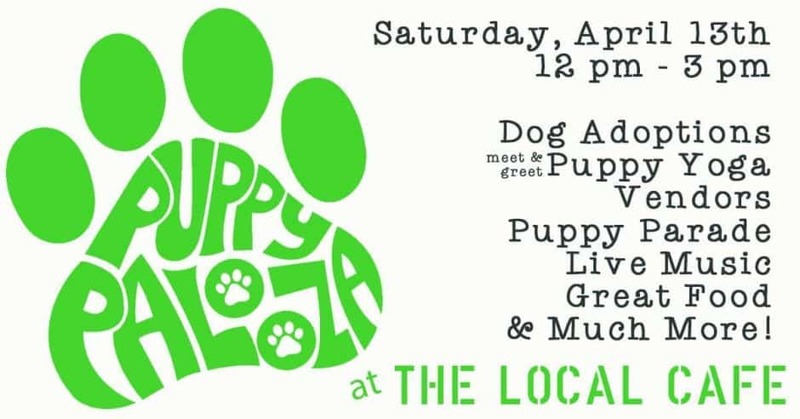 So come out and enjoy the music, eat some great food, check out the vendors and of course the puppies at “Puppy Palooza” at The Local Cafe” 211 Temple Hall Hwy, in Granbury.